It’s Sunday, time for another interview! Following my first interview with Quickestfox Marketing ,I participated in a Twitter Masterclass and learnt a bit more how this Twitter things works. I have reached out to various followers to be interviewed and very excited to write about http://www.jclearn.ie/. Let’s get connected! They say your Twitter Bio matters, and it does. When I saw Jack Manning’s Twitter Bio, it said he was 17, an running a business called JC- Learn. Tell us a bit about yourself & where you are located. I’m 17 years old and the two others in the team, Johnnie Bell and Eamonn Flannery are both 16. We’re all in Transition year at Clonkeen College in Dublin. I’ve been friends with Johnnie since playschool and we picked up Eamonn at Clonkeen a few years ago! During the Junior Cert I was disappointed to find there really wasn’t a lot of content online for my upcoming exams. Everyone recognizes how valuable technology is in life but this is only slowly coming into the Irish education system. I thought of the idea of JC-Learn during the Junior Cert but as I was really busy studying I put it off until the next year. We began work after the Junior Cert results in early September in which the team got a collective 30 A’s in the exams. After a few months of flat out work we launched it just before the Christmas exams in December. JC-Learn is an online study resource for Junior Certificate students. It is a comprehensive membership based site where a student can access everything they need all in the one place. On JC-Learn there are revision notes, A-grade past exam answers, study advice, a blog and our ask an expert service. We want to try to maximize marks while not spending large amounts of money or time. A student can either sign up for a free 14 day trial which gives access to just the science and geography content or for the full membership which costs €20 for the entire year. This full membership gives the student access to absolutely everything on the site. We hope to make a Leaving Certificate version in the future so we can then keep our customers from JC-Learn! I’m really interested by tech start-ups and all things business related. I really got my passion for success during the Junior Cert where I loved to plan things and work hard to achieve goals. Is this your full time job, a hobby or a bit of both? Currently this is the only project I’m working on fully. It’s also a past time for me as I’d much prefer to manage my business instead of watching TV or playing video games. I mostly work on it after school and on the weekends. The next two years will be pretty hectic with the Leaving Cert but we plan to keep it up as well. I’ve always been interested in technology and the internet since a young age. I made my first few website with Webs.com in primary school and always knew i’d do something tech based. I got great experience at my time in my local Coderdojo and my dad who works as an electronic engineer has always been an influence to me. Also the business world has always excited me from the perspective of the unlimited possibilities and the way your career is constantly changing. Yes, we know there are already some big players in the e-learning market for Irish education. However, we believe there is no one who offers the quality we do and because our site is specifically tailored for the Junior Cert we feel this helps students as most sites put their resources into the Leaving cert. JC-Learn at just 20 euro is a very economical way to prepare for exams compared to expensive grinds or revision books. How do you market your business? How are people aware of your business? Where can people find you? JC-Learn is mostly marketed on Facebook, Twitter and Instagram. This is where most of our target market are. We also use deals website, testimonials, posters, and email marketing to make people aware of our great new service. I see JC-Learn as having 5% of the Junior Cert students in Ireland as members by this time next year. Hopefully we can continue to grow and improve our features while getting more team members on board. JC-Learns goal is to create a network of students who can help one another over the long time and to revolutionise the way Irish students approach state exams. Do you plan to compete in the global marketplace? If yes, how? If no, why not? Maybe someday we might be able to make a different product for international markets but at the moment we are going to solely focus on Ireland as JC-Learn is just for the Irish Junior Cert. Well obviously as our business is fully web based technology has massively impacted on how we conduct business. Without technology we wouldn’t even have a business! Whom do you seek advice from for your business/ do you meet up with other business owners? If so, where? We have been fortunate enough to have so many people giving us advice on all elements of our business. They have really guided us through setting up and we are forever grateful for who helped us start. We usually talk over Skype with other business owners or over the phone. We’ve received support from our Local Enterprise office in Dun Laoghaire who sorted us out with a marketing mentor named Noel McGrath who helped massively with our operations. 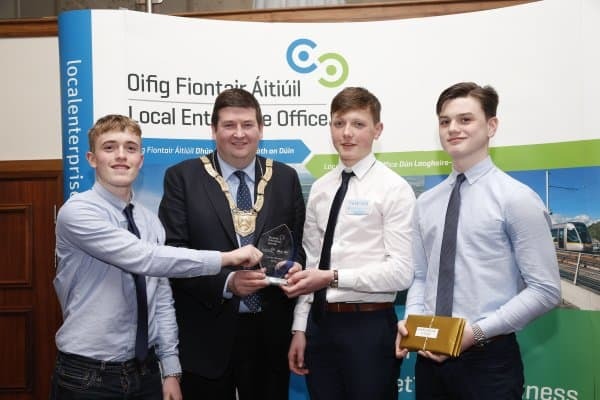 Also we won €500 in one for all vouchers given to us by the LEO when we won the senior category of the Student Enterprise Awards! Our business teacher has also been a massive support to us who has given us knowledge and has helped us find our feet in the business world. Also John Armstrong from Irish Tech News was so helpful in helping us start and market the business. Our customers would mostly be parents of students studying for the Junior Cert. Parents always want to help their children and JC-Learn is a cheap way to do exactly that. What are the biggest challenges for running this business? The biggest challenge for running JC-Learn is actually getting people to see it. The internet is so crowded no it’s extremely difficult to get any notice online. Marketing is probably one of our core areas of work especially in recent weeks. What keeps you going, when the chips are down? We just want JC-Learn to succeed and the team are completely willing to give it their all to make this happen. We always try to look on the brightside and are all confident in our business. I think self belief is a massive factor in success so obviously we are all very confident that JC-Learn will do good. Any special things planned for 2016? There is nothing major planned for 2016 besides from work and trying to improve and sell our service. Hopefully we can make it a really great and useful service. Any tips for someone who is thinking of starting their own business? The only big tip for anyone thinking of starting their own business is actually just do it. Make a plan and just do it. There is no point sitting around thinking of ideas if there is no action. You learn as you do so it’s so important I think to just get out and do it. The great business will follow! Please share the love and share this interview with your friends and family, as that’s the way these small businesses will get that little bit more of exposure and will help them grow! If you are a small business( or know a small business) in the West of Ireland and would like to get featured, please drop me an email katleen@workinglivingtravellinginireland.com and I’ll be in touch with next steps. Hope you enjoyed this very inspiring interview!